Valentine’s Day is almost here! It can be hard to plan anything romantic when you are a parent (and it’s a school night), so why not plan a Valentine’s date night at home? Put the kids to bed (and cross your fingers that they stay in bed), and spend a few hours together as a couple. Turn off the tv, put away those phones and light some candles to make it feel that little bit special. 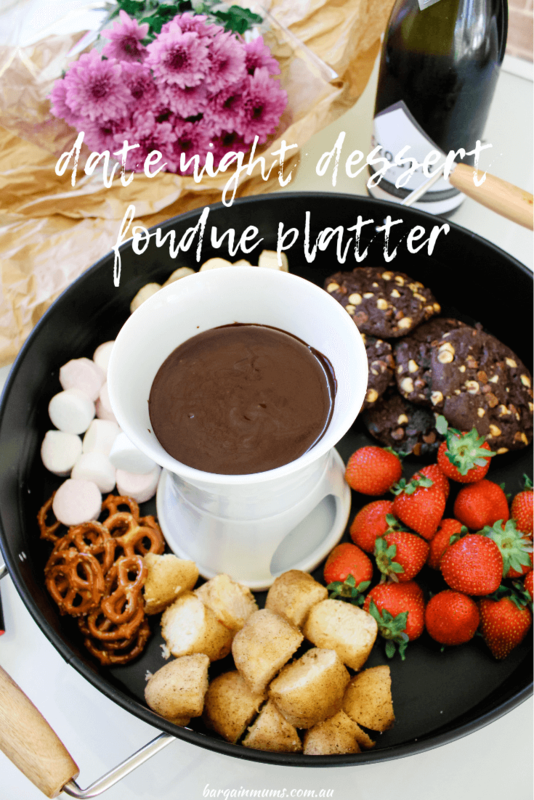 This date night dessert fondue platter is the perfect dessert to share together on Valentine’s Day. You could even make it a regular thing to have a date night at home once a month, and make a delicious meal or dessert together. Not only is this the perfect Valentine’s Day dessert, it’s also a great idea to put together when you have guests over or are entertaining a crowd. One of the great things about dessert platters is that you can add a range of fruits and sweets to the platter, and there is guaranteed to be something for everyone. It’s also a lot of fun to have a little taste of everything. This dessert fondue platter is no different. I have included a few fruits and some sweet treats in my platter, but what you include in your platter is really up to you. There are plenty of fruits that work surprisingly well with chocolate, as well as more savoury options, like the pretzels I used in my platter. There is something about that sweet and salty combination that is so delicious. Before you put together your dessert platter, you will need to invest in a fondue set. I picked up this great fondue set at Woolworths for just $10, all you need to add is a tea light candle and your fondue mixture and then you are ready to go! You can get creative with your dipping sauce when it comes to fondue, including white chocolate or caramel, but I decided to make a classic dark chocolate sauce. You can make the sauce directly in the fondue pot, but it’s quicker to pre-make the sauce on the stovetop, then pour the warm chocolate mixture into the fondue pot, keeping it warm. To make the dark chocolate sauce, add 1 cup of dark chocolate and 1/2 cup of thickened cream to a small saucepan over a low heat. Stir continuously until the chocolate has melted through the cream and the mixture is smooth. Transfer the mixture directly to the fondue pot with a tea light candle lit underneath. It’s a great idea to pre-prepare your dessert platter items, then as soon as the chocolate sauce is ready, you can put it all together on a serving tray or platter. All the following products used in my dessert platter are from Woolworths. Whether it’s for Valentine’s Day or any other night of the year, even us parents can make time for at home date nights. But really, any excuse to make this delicious fondue dessert platter will do.